Music is an integral part of life – from the charts to Classical music, music plays a major our daily lives. 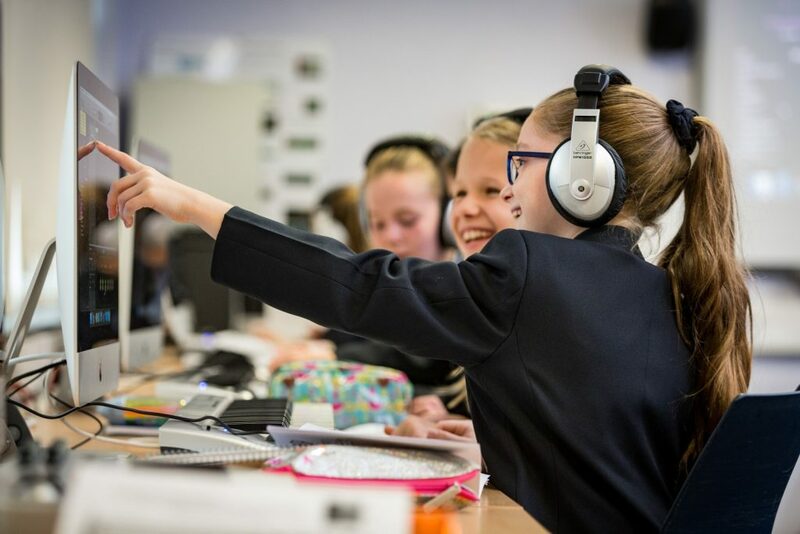 The National Curriculum requires students to have an understanding of performing a variety of music, as well as composing their own pieces and listening to and analysing pieces of pre-existing music. 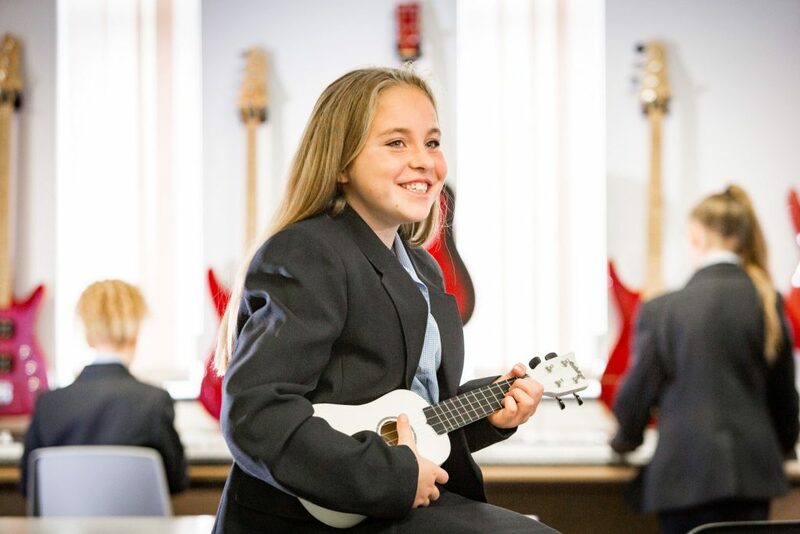 In Music lessons at Prenton, we meet these requirements by encouraging and supporting our students to perform on a variety of instruments including the piano, ukulele and singing both as an individual and as part of an ensemble. From this they will become independent learners capable of improving their own skills and also good team players who contribute well to an ensemble. The skills and knowledge that students will acquire in Music have direct links to many subjects that students study including Geography (African Music and Reggae), History (The Blues, Samba and The Orchestra) and Maths (Music Theory). At Prenton, there are two Music classrooms and four practice spaces for group work or instrumental tuition. One classroom is a dedicated Music Technology lab with twenty of the latest model Apple Mac computers running the newest software including GarageBand. These programmes are used from the beginning of Year 7 to improve students’ skills in Music Technology. Music students, along with those studying Performing Arts, have use of the Main Hall – with a three-tier stage, lighting rig and desk and a 32 track digital sound desk – and a Drama Studio. There are radio microphones for performers, a drum kit, a class set of keyboards and djembe drums, and a samba kit. In year 7 students have 2 lessons per week. They study 4 topics which are: Basic music skills; Environmental sounds; Elements of Music; Exploring Sounds. In year 8 students operate on a carousel with other arts-based subjects. They spend 27 lessons learning about these three topics: Film Music; Theme & Variation; Samba. In year 9 students have 1 lesson per week. They undertake 2 mass projects which focus on different skills throughout the year. Within musical theatre, students perform and compose music from the musicals. They learn about the different jobs available within the music industry, creating and producing their own songs. They also perform a full piece as part of an ensemble. These activities help develop the different skills needed to access the GCSE music curriculum in year 10. Component 1- Performance (30%): Students must record one solo and one ensemble performance of a piece of music of their choice. Internally marked, externally moderated. Component 2- Composition (30%): Students must create two compositions. The first composition is a ‘free’ composition in which the students can choose the genre. The second composition must fit within one of the 4 briefs released by Edexcel. Internally marked, externally moderated. Candidates are required to compose one piece of music which explores two or more of the five Areas of Study. This may be in any style or genre of the candidate’s choosing. Candidates have up to 25 hours of Controlled Assessment in which to complete the composition. This must be undertaken as an individual exercise under informal supervision. There is no time limit in terms of the duration of the composition but candidates should be aware of the need to demonstrate sufficient development of musical ideas in the music and as a consequence, very short pieces may not allow for this. 1. A recording of the final completed composition. This must be in a format that can be played on an external device such as CD or mini-disc. The recording may be made using live performers, ICT or a combination of both. · a combination of some or all of these. Component 3- Listening and appraising (40%): Students will study eight set works in order to complete the listening based on the set works. Externally examined, 1 hour 45 minutes. Why choose Music as an Option? · have an accessible approach to the formal listening skills, using a wide variety of music. · how to create and perform music as individuals and in groups. This course stretches students academically through the Listening Paper (Component 1) and the set works. In addition to this it requires students to creatively compose original music and the opportunity to perform to an audience. The workload in GCSE Music requires a continual approach throughout the course with large allocations of controlled time. There is a wide and varied programme of extra-curricular music at Prenton with something to satisfy every Musician’s needs. Groups include: Choir, Samba Band, Ukulele Club, Keyboard Club, Song Composition Club, Catch-up GCSE, and Musical Theatre through the Prenton Theatre Company. There is a full scale school musical every year, a talent show and musicians are invited to take part in assemblies at Prenton showcasing their talents. A real strength of the department is the inclusive approach adopted whereby all students are encouraged to participate and excel. Lyricist, video game composer, music website webmaster, tour coordinator, record producer, singer, rock star, night club dj, orchestrator, artist and repertoire, promotions manager, music publisher, booking agent, session musician, tv producer, recording engineer, music journalist, website content producer and many more.